All the bags are flavour colour coded. They have a distinctly Gaelic stylised writing expressing the name and underneath the flavour is written in large italics. The backdrop to this writing is a brown Ridged Crisp effect. As the whole thing is done in two colours it looks modern but it also means there are no stand-out features. 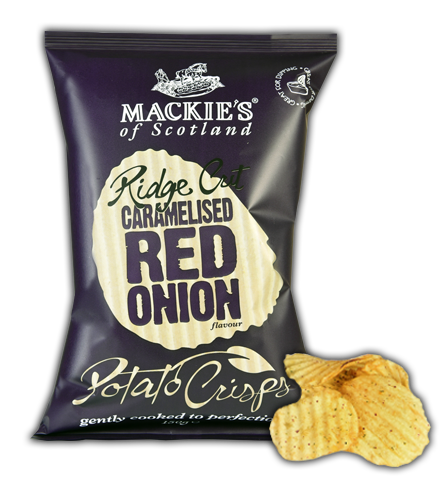 As with all Mackie's thickly cut Crisps, they had a rather biscuit or cracker like Crunch, that began firm and drifted through a variety of stages until they mulched up. These Ridged Crisps featured a certain thickness that was necessary to sustain the deep Ripples. There was some darkish seasoning about and a spot of potato on edges. A Nose Plunges Test revealed a hint of Onion, but as these Crisps were thickly cut, any flavour was influenced by the thick potato. There was a hint of sweetness, but the over-riding flavour was Pepper. These were very tasty Crisps, but they could easily have mentioned the word 'Pepper' somewhere in the title.